The Waverley circa 1860s sat on Water Row, Govan just off Govan Road. In the 19th century the Inn became known as the Waverley Tavern, popularly known as the “Buc” for the proprietors name was Mr Buchanan. It was especially popular on Saturday afternoons and evenings, when the clientele gathered to drink porter and eat hot meat pies. Around 1900 the licence was transferred to a pub in Langlands Road. Thanks to the Mitchell Library. In 1852 Mrs A Buchanan owned the Waverley Tavern, Water Row. James Couper a grocer and Spirit Dealer, Water Row. 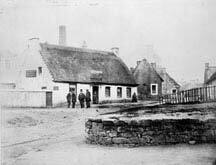 Neil B Dalveen owned the Banks of Clyde Tavern, 3 Water Row.